The vision of CCHS, as a ministry of Calvary Baptist Church, is to be a cutting edge learning center that strengthens the home, the church, and the community by providing the highest quality Christian education to all students. The mission of CCHS is to partner with the Christian home and the church to provide a challenging college preparatory Christian education that equips students to live successfully according to God’s plan for their lives. A biblical worldview is foundational to our mission, which is fulfilled through students acquiring biblical truth, applying biblical truth, and attaining their highest level of academic achievement. The CCHS philosophy rests on the belief that all truth is God’s truth, and the Bible is the only inspired and infallible authoritative Word of God that contains that truth (2 Timothy 3:16-17). Therefore, the Bible must be foundational in all areas of a curriculum that is designed to enable pupils to develop to their full potential spiritually, mentally, socially, physically, and emotionally (Luke 2:52). The historic Christian view of life as presented in the Bible is central to the focus of CCHS. Since God created and sustains everything through His Son, Jesus Christ, the universe and humanity are dynamically related to God and exist to glorify Him (Colossians 1:13-18). Man, being a sinner by nature and choice, cannot glorify or know God apart from accepting God’s free gift of salvation through His Son (John 3:16, Ephesians 2:8,9). Man is recreated in God’s image and restored to a position of true knowledge, righteousness, and holiness through faith in Jesus Christ (2 Corinthians 5:17). A quality educational program must enable students to prepare for success in college, or other post-secondary programs. Graduates must also be equipped to succeed in the world of work and in building strong Christian homes. Therefore, curriculum that includes honors and dual-credit college classes with an emphasis on technology is essential. 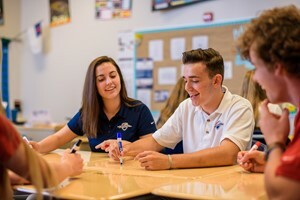 A well-rounded education includes ample opportunities for student involvement in competitive athletics, enriching fine arts activities, and other student activities. Spiritual growth and high academic achievement are central themes of the Calvary experience. Quality education results from quality people working in a quality environment with quality materials. The Calvary learning environment is designed to be an exciting, imaginative, and disciplined laboratory which nurtures creativity, high standards of scholarship, spiritual development, and a biblical philosophy for living. The Christian men and women of the faculty and staff have each demonstrated professional excellence and a personal commitment to Jesus Christ. Their desire is to challenge students to achieve academically to the highest levels of their God-given abilities while becoming the persons of high moral and ethical character God desires. The end result of Christian education is to produce academically successful graduates who possess a biblical worldview -- a philosophy for living that views life’s challenges and opportunities through the Bible. Because such education is a parental responsibility, the school functions as an extension of the home to aid parents in providing this biblically- based educational opportunity. CCHS is committed to a close working relationship with parents and welcomes parental involvement in the school.